The exposed normal ocular surface consists of cornea and conjunctiva. Epithelial cells, goblet cells and immune cells are present in the conjunctiva. Here, a non-invasive, technique of impression cytology is described using an impression cytology device and flow cytometry to analyze immune cells in the conjunctiva. Bose, T., Hou, A., Lee, R., Tong, L., Chandy, K. G. A Non-invasive Way to Isolate and Phenotype Cells from the Conjunctiva. J. Vis. Exp. (125), e55591, doi:10.3791/55591 (2017). Traditionally, ocular surface cytology is studied with techniques such as spatula technology and brush technology. The problem with these techniques is that they may induce traumatic lesions on the surface of the eye, which can progress to scarring, eyelid deformity, limbal stem cell deficiency and in some cases, cause great discomfort to the subject. To avoid these clinical problems, impression cytology (IC) was developed to diagnose dry eye disease and later neoplasia, atopic disease, vernal keratoconjunctivitis and keratoconjunctivitis sicca. Typically, clinicians manually cut filter papers into required shapes and apply these to the ocular surface. Here, we describe how to perform IC using a commercially available medical device. This technique is explained here followed by immunophenotyping by flow cytometry. This technique requires less manual handling and causes less injury to the ocular surface. Impression cytology (IC) was first performed in 1977 by Thatcher et al1. They used a plastic impression disc to collect conjunctival cells from patients instead of other techniques available at that time such as scraping, swabbing or pipetting1. The current technique of IC uses an absorbent filter paper2 to imprint the bulbar and palpebral conjunctiva and collect the most superficial layer of conjunctival cells. These cells, having reached their final stage of differentiation, are continuously shed into tears3. Three major populations of cells are found in IC specimens: epithelial cells4, goblet cells3,5, and mucosal-associated lymphoid tissue viz epithelium-associated effector T cells or dendritic cells6. Ocular surface cells in IC samples can be analyzed by microscopy, immune-blotting and reverse-transcriptase polymerase chain reaction (RT-PCR)7. Flow cytometry has been recently used to analyze immune cells collected by scraping the IC membrane8. Interestingly, IC6,9 has been used to evaluate many ocular surface diseases including keratoconjunctivitis sicca, vitamin A deficiency, cicatricial pemphigoid, atopic disease, superior limbic keratoconjunctivitis, vernal keratoconjunctivitis, and epithelial squamous metaplasia. IC has also been used to evaluate the impact of wearing contact lenses, detecting ocular surface microbes, and testing therapeutic efficacy and tolerance of therapeutic interventions in longitudinal studies10,11,12. The medical device (EyePrim) is supported by a type of polyethersulfone (PES) 0.2-µm membrane, which has been previously validated for the technique of ocular impression cytology with flow cytometry (OSIC-flow) and opens up opportunities to use longitudinal sampling to monitor disease progression and response to treatment (e.g., the detailed analysis of intraepithelial leukocytes defined as putative disease markers for progressive conjunctival fibrosis in mucous membrane pemphigoid)13. Early researchers used autoclaved PES filters that required manual impression. As a result, the yield was variable and user dependent. The advantage of this medical device is ease of use, standardized pressure (Pa or N/m2), and enables repeatability, reproducibility, and consistent cellular recovery. This technique is useful in an out-patient clinic because it is non-surgical, easy-to-perform and rapid. This is a Class I (sterile) medical device according to the directive 93/42/CEE, CE 0499 (SNCH). It only requires topical anesthesia during the procedure, which ensures maintenance of the integrity of the ocular surface. Following IC, cells can be processed immediately for flow cytometry. Moreover, it is possible for non-ophthalmology technicians and nurses to be trained to sample the ocular surface. Despite the improvement of IC over other techniques, several challenges remain. For example, there may be variation due to the area of the sampling and regional differences in the bulbar conjunctiva depending on the position of the IC. Another source of variation is due to the application of different amounts of pressure during IC. 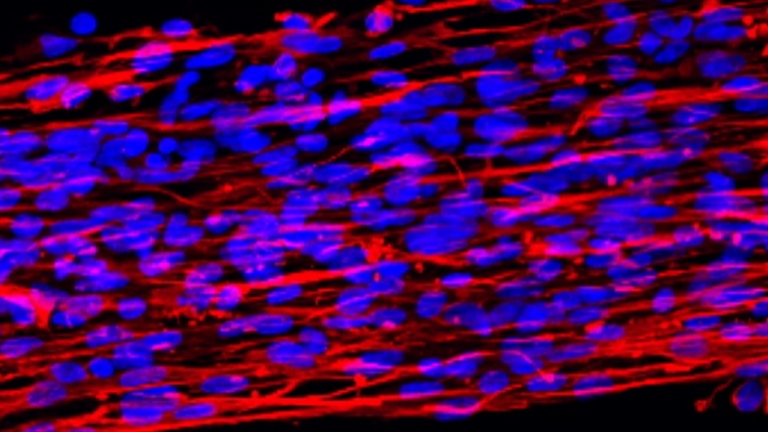 Other methodological issues involve standardization of cell processing: these involve duration and method of fixation, and the conditions of possible storage, which may impact stability of the sampled material. The overall goal of this technique is to develop a method of isolation of the ocular impression samples that is easy to use, non-invasive and can be applied to the immunological characterization of the clinical samples. All ocular samples used in this study were collected from the Dry Eye Clinic at the Singapore National Eye Centre approved by SingHealth Centralized Institutional Review Board and the Nanyang Technological University Institutional Review Board, Singapore. NOTE: Subjects underwent clinical tests to assess the extent of inflammation and the severity of tear dysfunction before IC was performed. Clinical tests included non-invasive tear break-up time (NI-TBUT)14 and conjunctival redness (hyperemia)15,16 assessed with a diagnostic instrument, Schirmer's test17, Standard Patient Evaluation of Eye Dryness (SPEED) questionnaire18, and corneal staining19. After determination of the clinical status, anesthetize the participant's eyes by applying 1 - 2 drops of topical anesthesia, proparacaine hydrochloride, to the superior bulbar conjunctiva and inferior fornix. Wait for 4 - 5 min for the stinging sensation of the anesthetic to wear off. Collect samples from both nasal and temporal bulbar conjunctiva with two impression cytology devices. NOTE: One device is used for the collection of two impression samples. Here, two devices were used for the collection of four impression membranes. 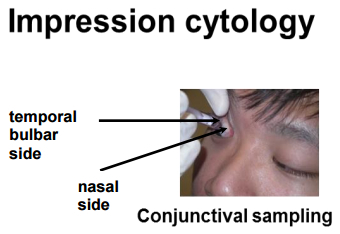 Position the impression cytology device tangentially on the conjunctiva. Press the push-button gently and hold for 2 - 3 s.
NOTE: The device comes with the membrane. Pressure is released automatically after pushing the button. It takes only few seconds to release the pressure and remove the device. Release the membrane into a microcentrifuge tube containing 1 mL of culture media (Roswell Park Memorial Institute medium (RPMI) + 10% fetal bovine serum (FBS) + 1% Penicillin-Streptomycin (Pen Strep)) by a scalpel. Isolate cells from the membrane of the device by continuous scraping for around 1 min with a 10 µL pipette tip. NOTE: The scraping is completed when the surface of the membrane becomes uneven. The cell numbers from each membrane is variable (100 - 500 cells/membrane). Process the samples within 2 - 3 h of collection. Centrifuge the cells at 400 x g for 5 min at room temperature to remove the media. Resuspend the cell pellet with 50 µL of flow cytometry staining buffer (phosphate buffered saline (PBS) + 0.05% bovine serum albumin (BSA)). Stain cells with a panel of antibodies (e.g., CD3 brilliant violet (BV) 510 (UCHT1), CD4 allophycocyanine-H7 (APC-H7) (SK3), CCR7 phycoerythrin (PE)-A, CD45RO PE-cyanin 7 (PE-Cy7)-A, and live/dead cell mark 7-ADD) at room temperature for 20 - 30 min in the dark. Use antibodies directly from the stock according to the manufacturer's protocol. NOTE: For the antibody concentration, use 2.5 µL of CD3-BV510, 1.25 µL of CD4-APC-H7, CD45RO-PE-Cy7, 7-AAD and 10 µL of CCR7-PE. Use peripheral blood mononuclear cells (PBMCs) to titrate the different concentrations of antibodies. For the titration, take the antibody concentration mentioned in the manufacturer's protocol and use half and one-fourth of the recommended concentration. Use the minimum concentration of antibodies to avoid spill-over to other fluorochrome channels. Clear signals were observed with the mentioned concentrations of antibodies. The compensation was performed by testing PBMCs initially according to the protocol mentioned in Williams et al.20 For testing, PBMCs were incubated with the same set of antibodies used here and compensated by comparing single and multiple antibody stains. After the incubation period, add 1 mL of staining buffer to the tube, mix well, and centrifuge at 450 x g for 5 min at room temperature. Resuspend cells in 200 µL of staining buffer. Run samples on a flow cytometry machine. Before acquiring the data, calibrate the flow cytometer channel voltages with cytometer setup and tracking (CS&T) beads to normalize the data acquisition on different days as per manufacturer's instructions. Open the flow cytometry data collection software, click "Set up & QC" button, choose the correct CS&T bead lot number, load the beads, and then click the "Start" button. Resuspend cells by gently tapping the tube before loading samples to the machine. Open the data collection software and click "Preview". When threshold rate is stable, click "Acquire". Monitor the sample level and click "Stop" when samples run out. NOTE: Acquire 10,000 events per sample. After acquiring 10,000 events, generate a SSC-A and FSC-A dot plot in the worksheet. Click the "Polygon Gate" button and draw a gate (this is P1) over all events with a FSC-A value > 5 x 104 to exclude debris. Click "Create dot plot" button to generate a new dot plot, right click the dot blot, choose "Properties" to open the "Plot Editor" window, and then choose "P1". Click the FSC-A on x-axis of P1 dot plot, change it to CD3-BV510. Draw a ''Polygon Gate'' to choose the CD3+ population and name it ''P2''. Click "Create dot plot" button to generate a new dot plot, right click the dot blot, choose "Properties" to open the "Plot Editor" window. Click the FSC-A on x-axis of P2 dot plot and change it to 7-AAD. Draw a ''Polygon Gate'' for 7-AAD- population and choose ''P3''. P3 here is CD3+ live cells. Click "Create dot plot" button to generate a new dot plot, right click the dot blot, choose "Properties" to open the "Plot Editor" window. Click the CD3-BV510 on x-axis and CD4-APCH7 on y-axis of the P3 dot plot. Draw Rectangle Gates on the upper and lower sides of the quadrant and choose ''P4'' and ''P5'', respectively. P4 is live CD3+CD4+ and P5 is live CD3+CD4- T cells. Click "Create dot plot" button to generate a new dot plot, right click the dot blot, choose "Properties" to open the "Plot Editor" window. Click the CD45RO PE-Cy7 on the x-axis and CCR7-PE on the y-axis of both the P4 and P5 plots. Draw ''Quad Gate'' on this dot plot. NOTE: Upper left hand side, upper right hand side, lower right hand side and lower left hand side quadrants here are naïve, central memory (TCM), effector memory (TEM), terminally differentiated effector memory (TEMRA) T cells, respectively. Figure 1: Collection of IC Samples from the Ocular Surface by the Impression Cytology Device. Samples were collected from the temporal bulbar region as shown. 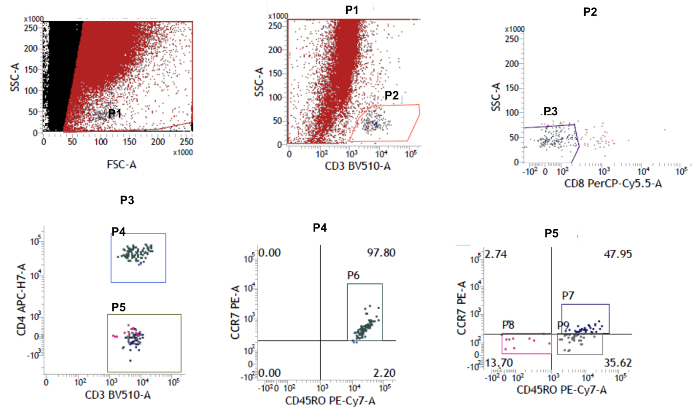 Figure 2: Dot Plot Graph using Flow Cytometry. Live 7-AAD- cells were selected. The CD3+ cells were first gated, and then this population was gated into CD4+ and CD4- subsets. 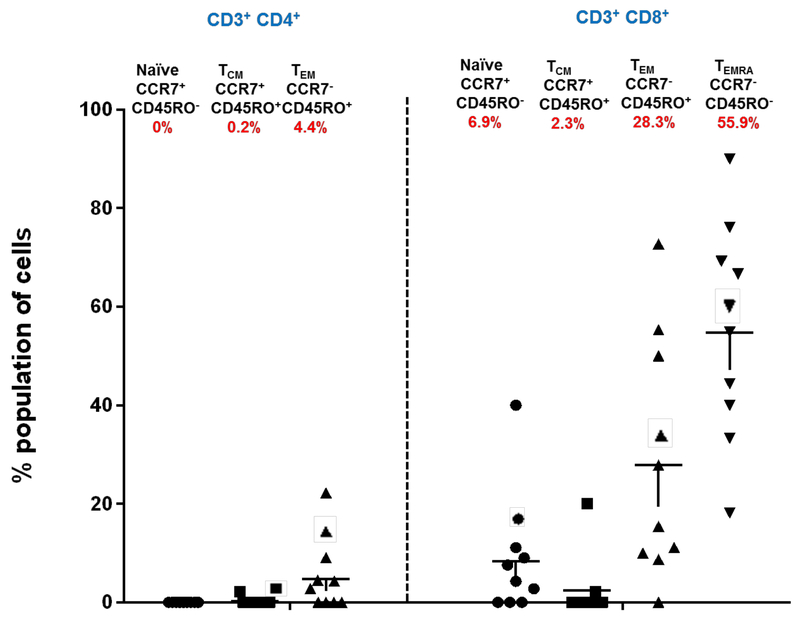 The proportions of naïve (CCR7+CD45RO-), central memory (CCR7+CD45RO+) and effector memory (CCR7-CD45RO+; CCR7-CD45RO-) subsets was determined with the help of CCR7 and CD45RO markers. Please click here to view a larger version of this figure. Figure 3: Immune Cell Sub-types in CD4+ and CD8+ T Cells of Healthy Human Ocular Surface. Distribution of conjunctival CD4+ and CD8+ naïve, central memory (TCM), and effector memory (TEM and TEMRA) subsets in healthy human controls; each data point represents a separate individual mean ± SEM shown. The percentage of the population is marked as red below the name of each of the populations. The total percentage of the population is 98%, because CD4+ TEMRA population was not included in the mentioned scatterplot (modified from Bose et al.21). Please click here to view a larger version of this figure. This is an easy, quick and less invasive technique that can be used in the out-patient clinics for relatively fast immune profiling in contrast to the conventional techniques like scraping, swabbing, pipetting or absorbent filter paper1,2. A variant of this technique is already being used in research settings22. The future application of the proposed methodology is for patient stratification in clinical trials with ocular diseases, especially those requiring immunophenotyping. A major challenge with this technique is the relatively few immune cells retrieved after impression collection and scraping. The total number of CD3+ T cells recovered from four impressions per individual varied from ~ 500 - 1,000 cells. The ocular samples were washed before the flow cytometry analysis for a minimal number of times to avoid further loss of cells. Critical steps and challenges that remain within the protocol are efficient collection of ocular samples and proper scraping of the membrane to achieve higher cell numbers. Nevertheless, this limitation is unlikely to bias towards any specific immune phenotype. The troubleshooting performed here to maximize the yield of cells was to reduce the number of washing steps after and before the incubation of antibodies. There are other limitations to using IC. In patients with severely keratinized or fibrosed ocular surface such as in Steven Johnson syndrome, the cellular yield may be even less than that in this study. The proportion of immune cells may change if the samples are stored instead of analyzed on the same day. It is difficult to predict if certain cell types are more resistant to storage than others. Previous studies have reported elevated levels of HLA-DR expression in the conjunctival epithelial cells23, so it would be interesting to evaluate the correlation between HLA-DR and levels of specific immune cells. Immune cells may also be associated with the expression level of chemokines. These issues should be addressed in future studies. The authors would like to thank Nandini Nallappan and Sharon Yeo for helping with the technical steps. The study was funded by a Start-Up Grant to KGC from Lee Kong Chian School of Medicine, Nanyang Technological University and by a Senior Clinician Scientist Award from the Singapore Ministry of Health's National Medical Research Council (NMRC) to LT (NMRC/ CSA/ 045/ 2012) and by a grant from the NMRC and administered by the National Health Innovation Centre to KGC and LT (NHIC-12D-1409007). Thatcher, R. W., Darougar, S., Jones, B. R. Conjunctival impression cytology. Arch Ophthalmol. 95, (4), 678-681 (1977). Egbert, P. R., Lauber, S., Maurice, D. M. A simple conjunctival biopsy. Am J Ophthalmol. 84, (6), 798-801 (1977). Baudouin, C. The pathology of dry eye. Surv Ophthalmol. 45, Suppl 2. S211-S220 (2001). Nelson, J. D., Wright, J. C. Conjunctival goblet cell densities in ocular surface disease. Arch Ophthalmol. 102, (7), 1049-1051 (1984). Brignole, F., et al. Expression of Fas-Fas ligand antigens and apoptotic marker APO2.7 by the human conjunctival epithelium. Positive correlation with class II HLA DR expression in inflammatory ocular surface disorders. Exp Eye Res. 67, (6), 687-697 (1998). Knop, E., Knop, N. The role of eye-associated lymphoid tissue in corneal immune protection. J Anat. 206, (3), 271-285 (2005). Lopez-Miguel, A., Gutierrez-Gutierrez, S., Garcia-Vazquez, C., Enriquez-de-Salamanca, A. RNA Collection From Human Conjunctival Epithelial Cells Obtained With a New Device for Impression Cytology. Cornea. 36, (1), 59-63 (2017). Tomlins, P., Roy, P., Cunow, J., Rauz, S. Assessment of the EyePRIM Device for Conjunctival impression for Flow Cytometry. Invest Opthalm Vis Sci. 54, 5430-5430 (2013). Barros Jde, N., Almeida, S. R., Lowen, M. S., Cunha, M. C., Gomes, J. A. Impression cytology in the evaluation of ocular surface tumors: review article. Arq Bras Oftalmol. 78, (2), 126-132 (2015). Calonge, M., et al. Impression cytology of the ocular surface: a review. Exp Eye Res. 78, (3), 457-472 (2004). Haller-Schober, E. M., et al. Evaluating an impression cytology grading system (IC score) in patients with dry eye syndrome. Eye (Lond). 20, (8), 927-933 (2006). Singh, R., Joseph, A., Umapathy, T., Tint, N. L., Dua, H. S. Impression cytology of the ocular surface. Br J Ophthalmol. 89, (12), 1655-1659 (2005). Williams, G. P., et al. Conjunctival Neutrophils Predict Progressive Scarring in Ocular Mucous Membrane Pemphigoid. Invest Ophthalmol Vis Sci. 57, (13), 5457-5469 (2016). Best, N., Drury, L., Wolffsohn, J. S. Clinical evaluation of the Oculus Keratograph. Cont Lens Anterior Eye. 35, (4), 171-174 (2012). Downie, L. E., Keller, P. R., Vingrys, A. J. Assessing ocular bulbar redness: a comparison of methods. Ophthalmic Physiol Opt. 36, (2), 132-139 (2016). Amparo, F., Wang, H., Emami-Naeini, P., Karimian, P., Dana, R. The Ocular Redness Index: a novel automated method for measuring ocular injection. Investigative ophthalmology & visual science. 54, (7), 4821-4826 (2013). Shapiro, A., Merin, S. Schirmer test and break-up time of tear film in normal subjects. American journal of ophthalmology. 88, (4), 752-757 (1979). Finis, D., Pischel, N., Konig, C., Hayajneh, J., Borrelli, M., Schrader, S., Geerling, G. Comparison of the OSDI and SPEED questionnaires for the evaluation of dry eye disease in clinical routine. Ophthalmologe. 111, (11), 1050-1056 (2014). Behrens, A. Dysfunctional tear syndrome: a Delphi approach to treatment recommendations. Cornea. 25, (8), 900-907 (2006). Williams, G. P., Pachino, A., Long, H. M., Rauz, S., Curnow, S. J. Cytokine production and antigen recognition by human mucosal homing conjunctival effector memory CD8+ T cells. Invest Opthalmol Vis Sci. 55, (12), 8523-8530 (2014). Bose, T., Lee, R., Hou, A., Louis, T., Chandy, K. G. Tissue resident memory T cells in the human conjunctiva and immune signatures in human dry eye disease. Sci Rep. 7, 45312 (2017). Williams, G. P., et al. The dominant human conjunctival epithelial CD8alphabeta+ T cell population is maintained with age but the number of CD4+ T cells increases. Age (Dordr). 34, (6), 1517-1528 (2012). Mrugacz, M., Zak, J., Bakunowicz-Lazarczyk, A., Wysocka, J., Minarowska, A. Flow cytometric analysis of HLA-DR antigen in conjunctival epithelial cells of patients with cystic fibrosis. Eye (Lond). 21, (8), 1062-1066 (2007).